Phone call the other day from Laura in the the Whistle Stop Shop at the Railroad Museum of Pennsylvania in Strasburg. She ordered six copies of The Last Caboose. Hooray! Then yesterday a phone call from Jessica at Historic Rail. They want to list our album in their spring catalog. Thanks, Jessica! Now it's picking up steam! It's not like I haven't been busy. We three of Doc Abbick in Trinity have just released our second album, one of fifteen original train songs called The Last Caboose. I wrote most of the lyrics for fourteen of the songs; the other is an instrumental. Dean Schechinger wrote most of the melodies. 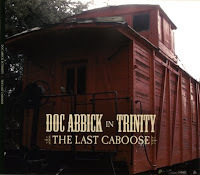 Doc Abbick put words and melodies together, arranging and producing our effort. And it's a good one. It always helps if you've got Johnny Cash working with you. We were on the verge of throwing out "Slow Your Engine Down" as unworkable when I asked the guys if we could maybe sleep on it before making a final decision. About four o'clock that morning, Johnny Cash sang the song to me in a dream. I woke with a start. When the band got back together later that morning to continue work, we revised the song to approximate what I'd heard in my dream, and we now think of it as something of a tribute to the Man in Black. I'm the guy who writes, so I'm charged with doing the promotion. I've created a presence for us on MySpace: http://www.myspace.com/docabbickintrinity . I've ordered postcards with the album cover on one side and the list of our songs on the other (if you'd like to have some of the postcards, let me know). I've gotten review copies out to the magazines and promotional copies out to radio stations. I have written some train magazines to see if they'd be interested in featuring our CD. I've written train museums to see if might want copies of The Last Caboose for the gift shop. I was interviewed by the Ripon Commonwealth Press and featured in the editor's column. And like that. As I say, it's not like I haven't been busy.